This article was first published in the Caithness Field Club Bulletin 2010 Vol 7 No 6. Early in the 20th century, Italian-owned cafes, ice cream parlours and chip shops spread through- out Scotland, run by enterprising immigrants, who saw Scotland as a land of opportunity, at a time when work was scarce in their own country. One family member would come over to Scotland to work here and were then joined by their brothers and sisters. In the case of Cabrelli's this has now reached the third and fourth generations, who now work in the professions so this business, as happened to so many others, has closed down. The Scottish-Italian connection spanned 110 years, from 1893 until 2003 when the cafe closed. This great family institution was for many years the place to go for the best ice cream, coffee, confectionery, hot snacks, Sunday papers and tobacco. Until the 1950s it was known as Iaccheri & Cabrelli. Louis Iaccheri and wife Cesira (a sister of Jo Cardosi from the Central Cafe in Thurso) came from Barga, in the province of Lucca, Tuscany and arrived in Wick from Aberdeen. Iacheri opened a chip shop in Macarthur Street Wick as well as the cafe down the High Street, known as the Camps. Around 1920 another Italian, Andrew Cabrelli moved to Wick from Dundee. He married Iaccheri's daughter Elsie and they had four children, Louis Cabrelli as well as three girls, Mary, Jessie and Irma. Mary still lives in Wick with Pina, Louis's widow. Both are enjoying a hard earned retirement. Pina came from Paisley, which became a protected area during WW2, so her father was interned in the Isle of Man during the war, as happened to so many foreign nationals. Pina's mother moved to Glasgow for the duration of the war. In the meantime Louis, Mary and her sisters spent the war years with their parents and grandmother in Italy, at their Wick doctor's suggestion for health reasons to benefit from the climate. Mary's Father would come over to Italy to see his children but once the war broke out that was not possible. The children had to stay there until the end of the war and those times were very hard. Louis was studying medicine but gave up his studies in 1946 in order to return to the family business in Wick. Mary studied at the Universities of Venice, then Florence. There was a byelaw forbidding Sunday trading for any shops which were open from Mondays to Saturdays. The solution was to utilise a basement store, which they called the Sunday shop, with the stock transferred from the main premises on a Saturday night and unsold items carried back before Cabrelli's cafe opened on Monday. In the 1950s, Jess Page, the then town clerk, (later Mrs Jess Campbell) helped to bring about an end to this restrictive regime. Louis married Pina in 1965 and they had three children Andrew, Anthony and Barbara, now all grown up. Pina and Louis expanded the business, running the Central Cafe and Rendezvous Restaurant directly above, on the corner between High Street and Bridge Street. They also had a restaurant of the same name in Inverness. 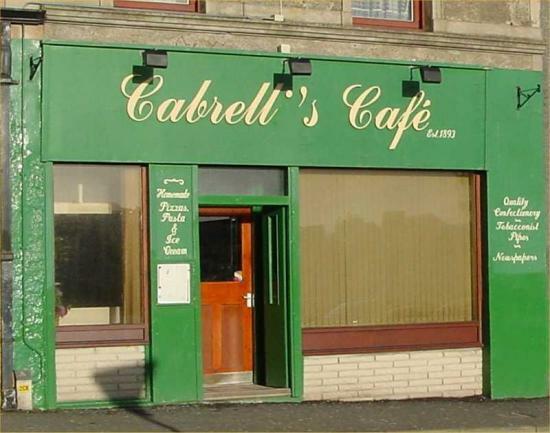 Cabrelli’s cafe was a well established meeting place, greatly missed by all of us and previous generations once it closed. It is now a Chinese restaurant. Mary ran an Italian Circle at Wick High School and I used to drive to Wick once a week to join in. Mary spoke to us in Italian so we progressed quickly. I have fond memories of her, Patty Cook (a boot and shoe repairer in Wick) and Archie Norman (a teacher) The three of them would discuss those times during the war, as all three of them were in Italy, all in Italian. Patty and Archie were in the services. They were in a little world of their own, comparing events from their own perspective and they forgot about us. We were fascinated of course and kept as quiet as church mice. Mary was an excellent teacher and I passed an O Level in a relatively short time, but I fear I disappointed her as I did not go on the take Highers. Pina followed in Mary’s footsteps, once she gave up the Café and taught Italian in the North Highland College in Thurso, while funding for the students was available. Italian was Pina’s first language as that was what was spoken at her home, but you would never guess that, hearing her speak English. Photo Gallery shows the cafe just before it closed in January 2003. Further articles will be added shortly.